Discover the Normandy coast in all its glory at La Vallée Campsite. 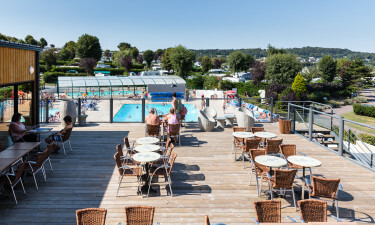 Nestled between the elegant resorts of Deauville and Cabourg, and overlooking the charming beachside town of Houlgate, come and discover the unspoilt beauty of the Normandy coast at the luxury camping site of La Vallée. On arrival you will have to pay a deposit (cash) of € 20,- for the barrier card and € 20,- per family for the wristbands for access to the pool. Why stay at the La Vallée Campsite? Start the day with a splash in one of the marvellous heated pools. The large outdoor pool is perfect for some pre-breakfast laps in the sunshine. 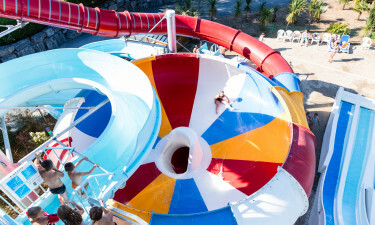 Toddlers can paddle about in their own shallow pool with a mini-slide, whilst older children can ride the big 5-lane water slides, which are situated away from the pool so as not to disturb the adults. The indoor family and children’s pools are ideal alternatives for cooler days. Relax in the bubbling waters of the Jacuzzi or stretch out on a sun-lounger and enjoy a little downtime. 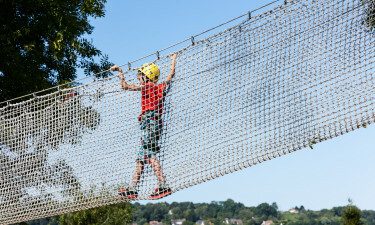 Children have 2 play areas with swings, slides, 15 climbing frames and a bouncing castle. They can don sumo wrestling suits for guaranteed laughs, go on a pony ride, join a workshop or participate in one of many games and activities organized by the campsite for their entertainment. Older children can practice their skills on the BMX circuit, climbing wall, archery range and adventure trail. Scuba diving lessons in the pool are open to both adults and older children. The whole family can compete at tug of war, trail games, beach volley ball and football in one of the fun La Vallée tournaments. For a more leisurely pursuit, try a game of boules or go for a relaxed bicycle ride and take in the wonderful scenery. Concerts and shows are held in high season, and those confident enough can enter the Miss and Mister Campsite competition! If all the sporting activities on-site have not yet sated your appetite for excitement, try the windsurfing, kite surfing and sailing at Houlgate beach. The chic resorts of Cabourg, Deauville and the more modest Trouville make delightful destinations for an idyllic day by the seaside. One of the oldest university towns in France, Caen is very cosmopolitan, has excellent museums and lots more things to see. The restaurant and bar have a terrace area, perfect for enjoying an evening meal under the stars. A takeaway service is available too, should you wish to enjoy your meal back at your mobile home. A grocery caters to all your immediate luxury camping needs, including freshly baked baguettes and croissants, in addition to gas bottles and newspapers . Moreover, the shops in nearby Houlgate are only a short walk away.